Diamond Head and a landscape of coconut trees and ocean waves are rendered in 14-karat tri-color gold accented with diamonds. This necklace is highlighted by seven red Pacific coral gems in hinged pieces of diamond ribbons in 18-karat white and yellow gold. At the heart of this elegant brooch is a lustrous opal. Cascading ribbons of 14 karat white gold and brilliant diamonds capture the opal’s iridescent beauty. Inspired by Kauai’s Na Pali Coast with its majestic cliffs and cascading waterfalls, this pendant features precious natural shape red coral from the depths of the ocean. Wave formations in 14 karat white gold shimmering with diamonds evoke Hawaii’s natural waters glittering in the sun – a Hawaiian waterfall or a lapping ocean at the beach. This graceful water motif is repeated on the back of the pendant with an open raindrop pattern crafted of 14 karat white gold. 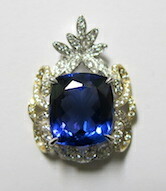 At the heart of this fanciful pendant is a stunning 10.48 carat cushion cut tanzanite. At each side, 14 karat yellow gold flourishes set with diamonds beautifully framing the center tanzanite. At the pendant’s base is a 14 karat white gold lotus design offset and complemented by a 14 karat white cold crown at the top of the pendant – both set with brilliant diamonds. “Bai Bao Dai” meaning Fortune Bag in Chinese is important in the Chinese culture. These fortune bags represent luck, good fortune, and prosperity. This design, named after the popular Chinese tradition, was created by first selecting a naturally shaped red coral piece and decorated using 14 karat white and yellow gold and diamonds. Formed deep within fiery volcanoes, peridot is commonly referred to as Hawaii’s volcanic gemstone. This design, which means volcano in Hawaiian, was handcrafted in 14 karat white and yellow gold and encircled with diamonds in a micro pave setting to reveal the gemstone’s vivid green-gold color. Inspired by the beauty of the Hawaiian Islands, this design features a stunning red coral pendant handcrafted in 18 karat tricolored gold and diamonds. This piece can be worn in two different ways, displaying the red coral centerpiece encircled in diamonds, or reversed to showcase Hawaii’s most iconic attraction, Diamond Head. 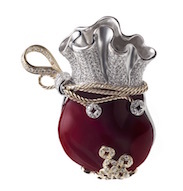 “Hidden Beauty” refers to this pendant’s unique turning mechanism which allows multiple ways to wear this exquisite pendant. 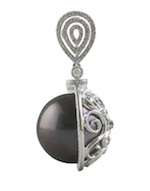 This design is handcrafted in 18 karat white gold and accented with diamonds to elegantly showcase the Tahitian Pearl centerpiece.